The most productive Blanking System on the market. Automatic Programmable Slit and Shear Line. 60” wide 14 GA. With two (2) Programmable Shears. Slitter Heads are automatically positioned based on quantities and width/length variables. 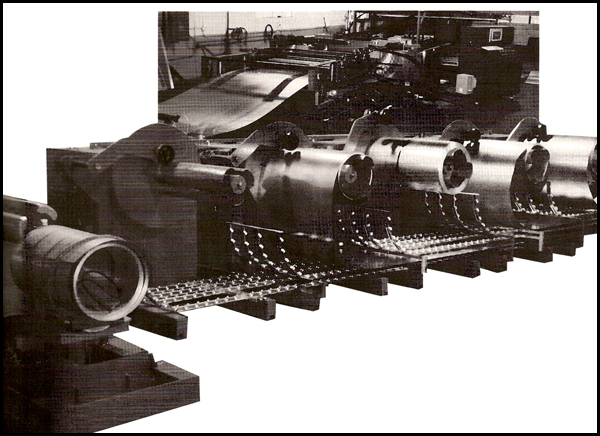 It can produce a variety of single blank sizes with no setup and a minimum of scrap loss. Our Programmable Slit and Shear Line is unique in design and the most flexible Blanking System on the market. It virtually eliminates Slitter setups and changeovers greatly reducing scrap loss between width and length variables. 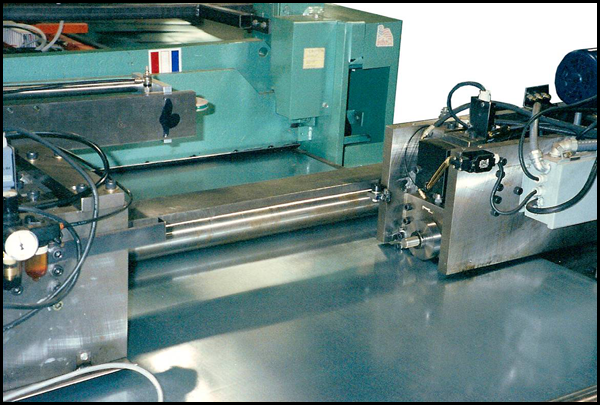 Utilizing individual Slitter heads with Programmable Servo positioning the system can slit and shear a single blank or perform a wide variety of blanking with no setups or down time between production runs with a minimum amount of scrap loss. 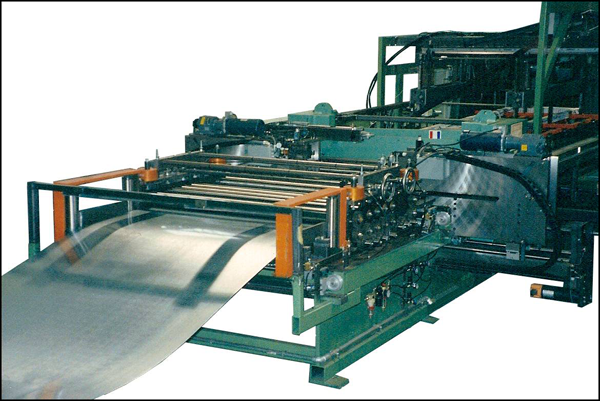 The primary saving of a Coil Fed Slit and Shear Line is to minimize scrap loss of re-shearing blank stock. Arbor Slitters require a physical setup and changeover and work good only with high volume blanking operations. The programmable self positioning Slitters eliminates extensive downtime for width changeovers giving you maximum utilization of the system thru-out all your production requirements. The Programmable Slit and Shear is more than automatically positioning the Slitter Knifes between production runs. It eliminates all the backing up, re-threading, re-shearing and scrap-loss involved in changing slit widths. The program is a combination Strip Feed and Slitter Knife Position System that eliminates scrap loss between slit width changes. The knifes disengage (open-up) out of the coil strip then re-position with out removing or re-shearing the coil strip. The Servo Feed positions the Slitters for the next slit width then engages (closes down) into the strip. The Coil Strip Feed will then position the coil strip into the shear to cut the blanks at the transition lead and trail slit point. Most systems are produced with one or two Programmable Slitters to handle a wide range of materials and gauge thickness. This system can handle up to four (4) Programmable Slitters. We offer this unique design in both semi or fully automatic program application. The semi automatic has all the features and savings of the fully automatic system with out the Servo Positioning. The Slitter Heads are positioned manually with lead screws and micrometer readouts. This might add about a minute when changing slit widths. Two (2) opposed Slitter units automatically engage and disengage the coil strip at the cutoff. Slitter Knifes re-position for the next width and engage the coil strip at the new slit width. Note! Roll Feed compensates for the Slitter Kerf eliminating scrap loss or the need to double shear at the Slitter Transition. For lower volume applications Slitters can be positioned with handwheel lead screws with micrometer readouts. Higher volume systems slit positions can be programmed from simple length width keyboard entries and Servo Drives. We offer the optional programming to download your daily or weekly production. The program will match up the various gauges (thickness), with the blank lengths, widths and quantities required. The system will orient the length/width variable to give you maximum usage and minimum scrap loss based on the master coil widths provided. Blanks can be marked or labeled as they are produced for additional fabrication or routing of the finished blanks. Unit can be designed with one (1), two (2) or four (4) Slitter heads to produce a wide variety of blanks from basic master coils. Decoilers for a quick change of various master coils.